So yesterday I went onto Apartment Therapy for the first time in a while. That website drives me crazy with their endless fawning and insipid use of the second person plural when they mean to use the singular. Read a couple of entries on that site and you'll know what I mean. "We think that our bunny rabbit's smart!" "We think that orange throw pillows can be a neutral in the right room!" "We feel guilty for using a Swiffer!" "We paid $125 a piece for embossed photo albums and this weekend we're getting organized!" Argh! Enough already. Anyhow, just as a blind pig can find an acorn from time to time, sometimes Apartment Therapy can uncover something useful. It's rare, but it does happen. More often than not though, I stumble upon something that reminds me why I don't frequent that site. The stock tank pool is eight feet in diameter and about two feet deep. Cathy's husband used plumber's putty and some gaskets to pipe in a pool filter and pump. After using the pool for about a month, so far they haven't had to add any chemicals to keep the water clean. All it takes is some regular swipes with a pool net, and of course regular changing of the filter, which collects algae and other miscellaneous debris. Cathy says the pump keeps the water moving enough to discourage mosquitoes, too. This is an idea so dangerously naive I have a hard time believing it. I don't doubt that the use of a pool filter is keeping that water clear. But the problem with pools is not the stuff you can see, the actual danger from pools is the stuff you can't see. The very same things that chlorinated water kills. These people are no doubt motivated by an attempt to keep their kids safe, but what they've done instead is provide them with a steaming bowl of E. coli soup. The contaminated water in that pool represents a far larger threat than the minuscule amount of chlorine used to keep pool water safe. You cannot recirculate water people swim in without sterilizing it. If you have an ill-informed problem with chlorine then for the love of God put in an ozone or UV filter. 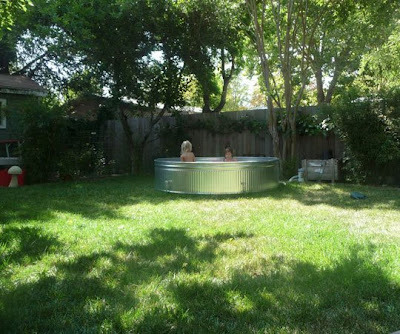 That harmless-looking backyard pool is an Amoebiasis, Cryptosporidiosis or Giardiasis outbreak waiting to happen. If not that rogue's gallery of water borne diseases, how about the staphylococcus aureus I can guarantee you is already in that water? People will get sick from swimming in this pool. It's not a matter of maybe either, it's a matter of when. I'm all for taking a look at the way I live my life and for rooting out things that do more harm than good. 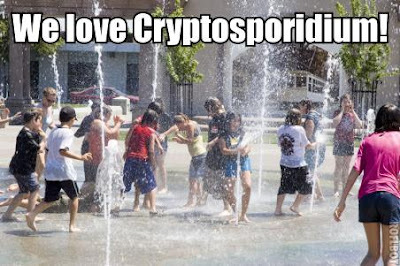 However, chlorinated water is not one of them. The safe water supplies those of us in the developed world enjoy and take for granted are one of humanity's crowning achievements. Imagine, I can drink from the tap in my kitchen and not get cholera. That verges on the miraculous frankly. The headlines were screaming this week about the amazing and unprecedented increase in the number of people in the US and the rest of the developed world who are living past 100. That did not happen because those centenarians swam in unchlorinated pools. In fact, it happened precisely because they swam in chlorinated pools. Human beings' increased life spans and the fact that we're healthier today than we were a hundred years ago is due to advances in public health. Period. Do not throw the baby out with the bath water, no pun intended. Please do not swim in untreated swimming pools or hot tubs. You will get sick. Chlorine is your friend folks, really.